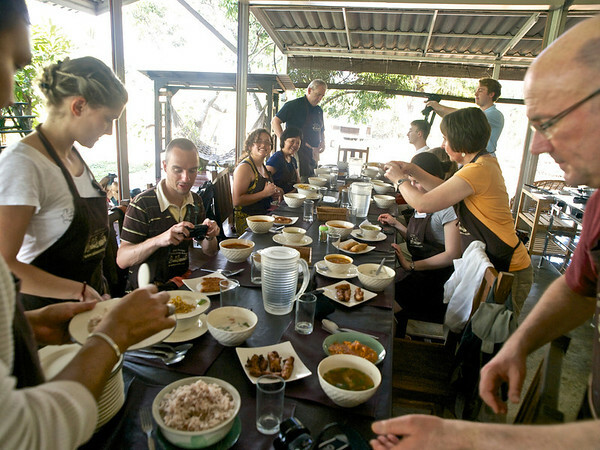 As a chef, as well as a long-term traveler, I have tried several cooking classes in my global wanderings. 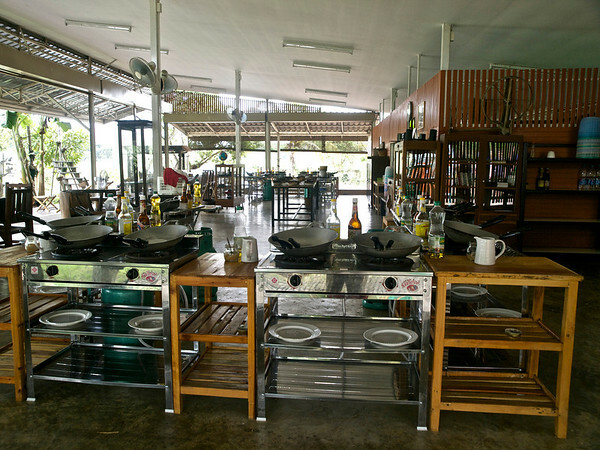 So it was only natural that I would investigate the numerous cooking classes available here in Chiang Mai. I digested (no pun intended) around a dozen brochures and read a number of often contradictory online reviews. 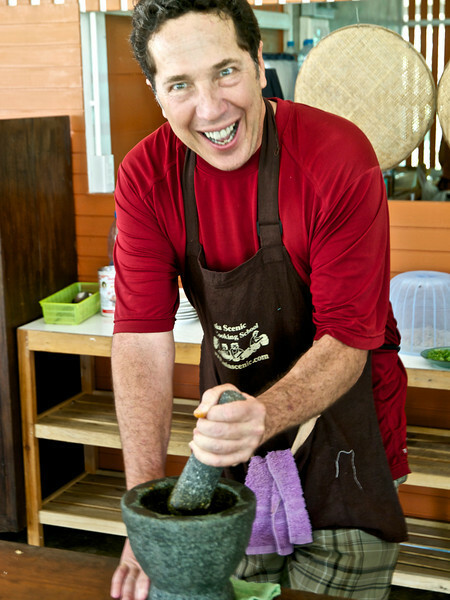 I finally took the plunge selecting a cooking class at Asia Scenic Thai Cooking School. They promote themselves quite well around Chiang Mai. They offer half and full day courses in town and a full day course at their farm. I signed up for the latter. The day started with a pickup at my guesthouse. 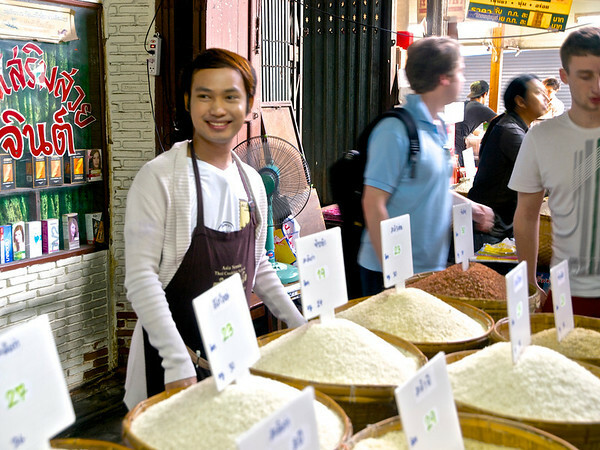 We went to the local market to learn about traditional Thai ingredients. Berri explains the finer points of Thai rice usage. Then we drove 20 minutes out of the city to their sustainable farm which is based on HRH the King’s new Theory of Agriculture and Philosophy of Sufficiency Economy. The 1.6 acre farm is lovely and the cooking facilities are clean and well organized. 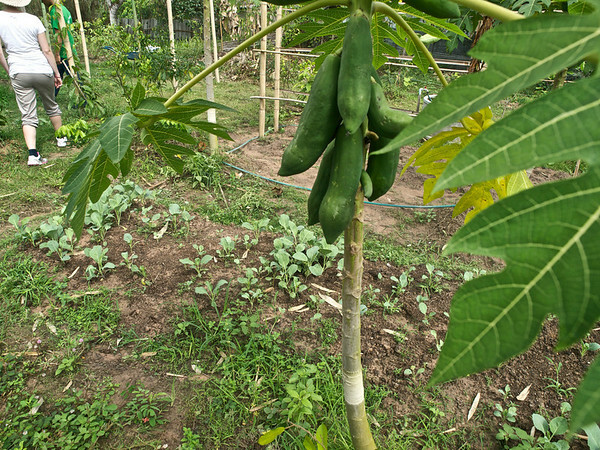 Green papaya and Chinese kale are among the many ingredients grown here. We were given a tour of the farm and were then welcomed with Meang Kum, a traditional Thai greeting. These are plates containing items of the five essential tastes in Thai cooking: sweet, salty, spicy, bitter and sour. 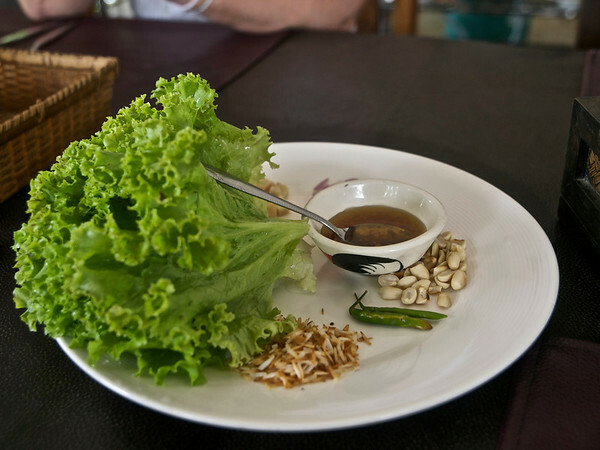 The items are rolled together in the betel or lettuce leaf and quickly consumed. When I arrived, I was a bit concerned to find that the class had grown from six to about 15 students. I like small classes; however, in this case the size worked to my advantage. Each student is allowed to choose one dish each from six different categories to learn to prepare. Since between us all, every possible dish was chosen, I actually learned to prepare 23 different items. These are the dishes that Berri demonstrated. The ones in bold are those that I actually cooked. 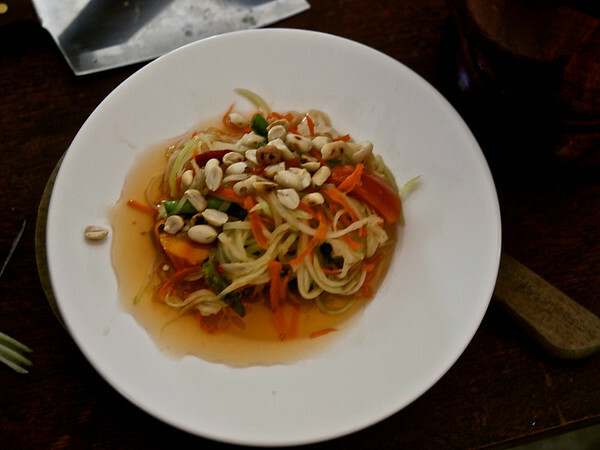 In the process, I got to prepare three of my very favorite Thai dishes! Berri spoke of the importance of emotions in the preparation of food. As the chef at HeartMath for 15 years, this is something I know quite a bit about. We did a lot of research and practice there on the effects of positive emotional states on the preparation of food (they do improve the taste). 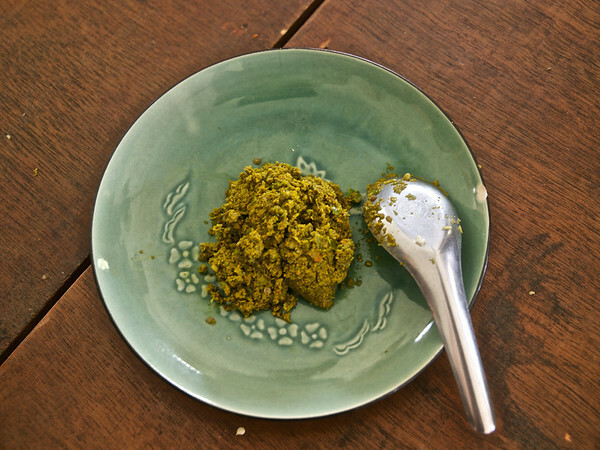 While grinding green chilies, kaffir lime leaves and other ingredients to a pulp in a large mortar for example, I was told to get angry, but smile. The thought still makes me laugh! Do I look angry enough? End product: my green curry paste, a decent upper body workout. The day finished with a feast and was over all too soon. We were given a well-detailed cookbook with all of the recipes to keep. I am really looking forward to adding more Thai dishes to my repertoire. As always, your comments and any questions (cooking class or otherwise) are welcome below. All comments are answered by me as quickly as possible. How fun Linda, thank you! Whenever I get back that way we will have to have an Iron Chef Thai Cookoff. Dan, great to hear from you and thanks. I tried to contact you but couldn’t get the email to go through. Now I have it. Yes the cooking class was great. Heading south for some diving in three days. Hope we can connect again soon. Cheers. 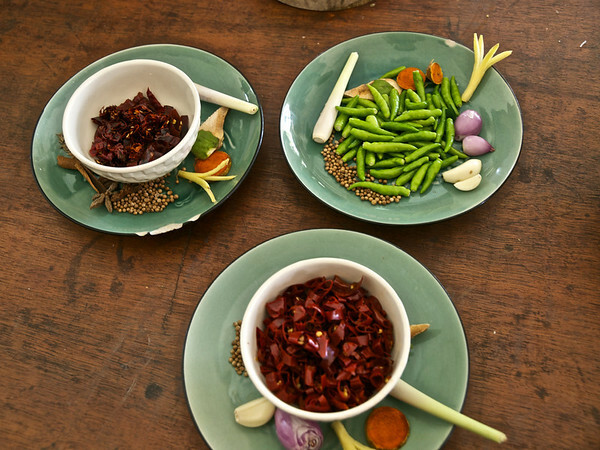 A cooking class would be the first thing on my to-do list in Thailand. Sounds like a lot of fun and a perfect way for you to spend a day! Yummy stuff! Love the photos and your story~hope your hand is healing and that you’re up and about soon!